The Secretary of State for Defence, Dr Liam Fox, here explains what the MOD is doing to support our serving personnel and veterans and why rebuilding the Military Covenant is so important. Every year on Remembrance Day, as the ranks of veterans and members of the Armed Forces march past the Cenotaph, we are reminded that we have an obligation not only to remember the fallen, but to honour the living too. We have a duty as a nation to give our Armed Forces the best support we can in return for the sacrifices they are prepared to make in our name. This is the Military Covenant which has come under much strain in the last decade. As the tempo of operations increased, Service personnel and their families often felt unsupported and stretched to the limit. The Government has pledged to rebuild the Military Covenant. The Coalition Agreement recognises that we need to do more to ensure that our Armed Forces and their families have the support they need and are treated with the dignity they deserve. To help make this happen we will soon publish a new tri-Service Armed Forces Covenant, the first of its kind, that sets out the relationship and obligations between the Armed Forces Community, the Government and the nation. We are also putting into law a requirement for the Government to make an annual report to Parliament on everything that is being done to live up to the Covenant on things like healthcare, housing and education. In the difficult economic circumstances the Government has inherited, where all parts of society are having to make sacrifices, repairing the Covenant will not be straightforward. As public servants, the Armed Forces are subject to the difficult decisions we have had to make on pay, pensions and allowances. But where we can make early progress we will. We have doubled the extra money paid to those serving on operations in Afghanistan and we have improved R&R [Rest and Recuperation] arrangements. But there is a lot more to be done. We need to make life easier for forces families who, because of the demands of Service life, find it difficult to access the public services most of us take for granted. Some of what we need to do will cost money, and, with budgets squeezed, we may not be able to go as fast as we want. However, the recent report on the Military Covenant by Professor Hew Strachan suggests a number of ways where we can move forward and we are implementing some of these now. Looking after people who are currently serving is only part of the Covenant. The duty of care does not end when active service ends. The community of veterans in Britain is estimated to be around five-million strong. The vast majority of men and women who serve make the transition to civilian life successfully. Many of the skills they learned in the Armed Forces are highly sought after. Not only practical trades but character traits too: self-discipline, self-reliance, leadership. For a small number the transition is not so easy. Some find it difficult to get work or struggle to fit in. Others may suffer more serious problems as a result of their service, both physically and mentally. These are the people who need our help most. First we need to give people the help they need when they leave. It takes time to turn a civilian into a soldier, so we should take the time to turn a soldier into a civilian. The resettlement programme helps Service leavers to navigate civilian life - everything from finding a job, to benefits, to education and retraining. We are looking at making sure it is focused on those who need it most. We are also putting specific schemes in place to help new veterans attend university, and, through our ‘Troops for Teachers’ programme, encouraging veterans to get into the classroom and use their skills to help a new generation. Second, when a veteran falls on hard times, there should be somewhere to turn and people who will help. This can be from problems with debt to more difficult issues such as homelessness, addiction or mental illness resulting from their service. Such difficulties can occur years after leaving the Services so we need a proper partnership between all arms of government that can provide support, national and local, and with the NHS. This means giving veterans priority status on local housing schemes to tackle homelessness. It means providing more money and more nurses to improve mental healthcare. And it means working with the charitable sector to get the right support to the right people at the right time. 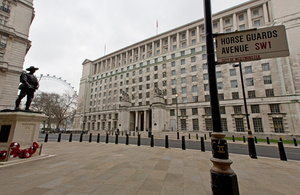 The Coalition Government is determined to strengthen links with the charitable sector. We have a vision of an active, caring society in which people come together to solve common problems. This is the only way we can make a reality of the Military Covenant, because the duty of care is on all of us. Government at all levels must take the lead, and that is what we are setting out to do. We cannot repair the Military Covenant in one go, but it is testament to the strength of the Covenant in the country that there are so many people out there who recognise the debt we owe our Armed Forces and are prepared to play their part.